The opening chapter of the book is called ‘Dead Man Moving’. And if someone knows about death in the mountains it is Joe Simpson. He was left for dead in Peru and yet he came back to tell the tale. However that is the story Touching The Void deals with. 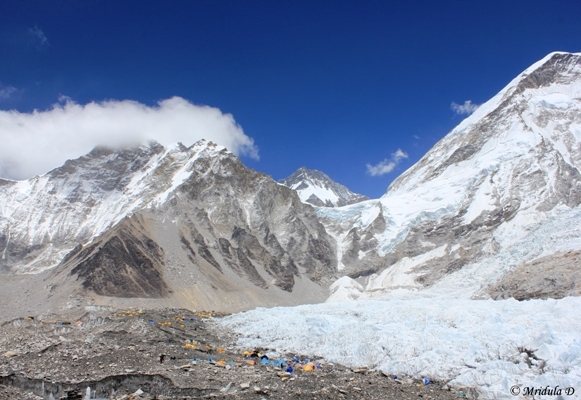 In Dark Shadows Falling Simpson moves his attention to the Everest region and to a large extent the present day climbing ethos which includes guided expeditions. So far you can turn back and tell me that there are countless other books that talk about the same. I agree but this one has a section on the trekking culture in the region and that surely got me puzzled. Also Simpson asks hard questions about present day climbing, particularly the guided ones. But let me go back to the first chapter. It talks about South Col which is high up on Mount Everest. A climber is dying about 30 meters from a well stocked tent. It could have been any climber I am sure but he was an Indian. What do you think would happen? That people from the tent would go out and get him in? Offer him comfort? Hold his hand? Give him water? Well nothing of that sort happened. No body came out of the tent and offered anything to a dying man. Simpson brings in his own near death experience to say that he fought so hard to live because he didn’t want to die alone. He then goes on to talk about the summit at any cost culture and wonders why are people climbing the Everest? There are many who could do it only via guided expeditions. On their own they do not have the ability to climb the mountain. For them the route has to be prepared, the tents pitched, oxygen used and a guide to help them through. And then there are those who climb in small teams, rely on each-other and climb without oxygen. So is it that the mountain belongs to one group and the commercial groups are impostors? Is the modern climbing community so goal obsessed that human values have taken a backseat? Human values like offering comfort to a dying person no longer seem to be universal. If it affects the summit chances is it fine to leave someone dying without a crumb of comfort? These are some of the questions that Simpson raises. Of course there are no easy answers offered. But the section that disturbed me most was the section on trekkers and their response to crisis. I have trekked in the Everest as well as the Annapurna region and I was shocked to read his account of trekkers in Chapter 6. In 1995 November a freak blizzard hit the Annapurna region. It looks like trekkers left their guides and local staff in tough conditions to fend for themselves and in some cases eventually die! He also mentions trekkers disobeying their guides in spite of hardly knowing anything about the region. I can to an extent understand aggressive behavior from mountaineers as theirs is a high stake game. But trekkers? I mean what is there in a trek? Anyone who is determined or marginally fit can trek. So I was really shocked to read of accounts where people disregarded horrible weather to put lives at risk, all for a trek! In the end he asks a very pertinent question- Just because a trek or a climb has been paid for, is there any guarantee that it will happen? I mistakenly thought everyone knew the answer! Dark Shadows Falling is a compelling book about modern day climbing ethos or the lack of it. And if you are a mere trekker like me you should definitely read chapter 6.